We've had Pokémon shaming, and now we have the United Federation of Planet's edition. These four seem even less ashamed than any pet I've seen. C'mon, Picard, I know wrenching philosophical questions that eat at your soul are your bread and butter. For all we know, this is actually how Starfleet would have handled it. 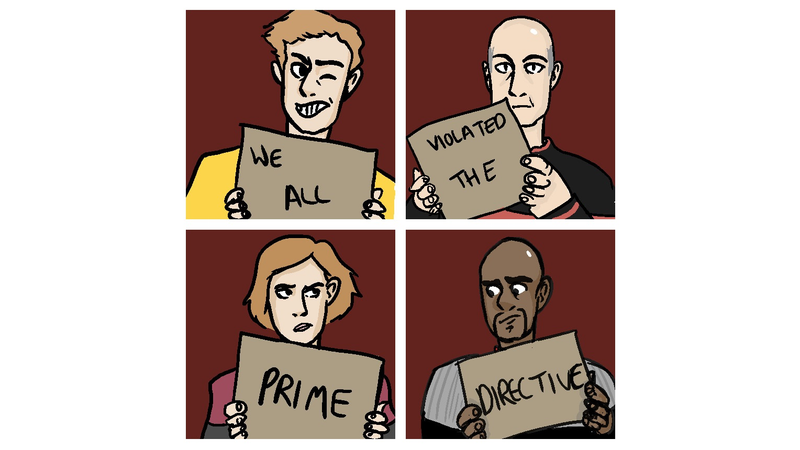 The Prime Directive was violated all over the place, and only twice in the entire franchise (according to Memory Alpha) did we hear about punishment. One of them is a formal reprimand. I think this counts. The art's by Em and can be found on her art tumblr.